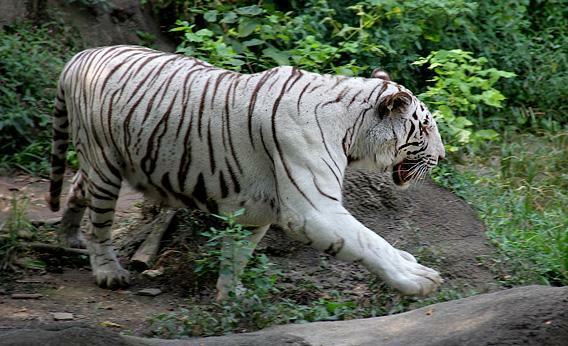 White tiger controversy: Zoos shouldn’t raise these inbred, ecologically irrelevant animals. Everything you’ve been told about this exotic, royal, endangered species is wrong. A white tiger from the Cincinnati Zoo. A white tiger is a striking creature. Tigers are always impressive animals, but when you take away the orange, the result is a big cat that looks like a phantom out of a dream. They seem almost magical, and yet I firmly believe that the world would be a better place if there was not a single white tiger in it. There are only about 4,000 tigers, at most, remaining in the wild. Yet there are probably tens of thousands of captive tigers around the world (there is no official census). This would appear to make a compelling case for the existence of zoos and private collections. If tigers can survive and breed well in captivity, then perhaps more can be introduced to the wild when safe habitat becomes available. Yet that system isn’t working the way we think it does. A huge number of the captive tigers are hybrids of various subspecies and are so inbred that they will never be suitable for reintroduction to the wild. No tigers are more emblematic of this problem than white tigers. I recently asked friends on Facebook to write down their thoughts about white tigers without searching for any new information. Some very intelligent people were under the impression that white tigers are a variety of Siberian tiger, camouflaged for a snowy climate. Others applauded zoos with white tigers for supporting conservation of white tigers while lamenting a lag in reintroduction efforts. Only one out of 27 respondents knew that white tigers are not a subspecies at all but rather the result of a mutant gene that has been artificially selected through massive inbreeding to produce oddball animals for human entertainment. This level of misinformation should not come as a surprise. Many of the venues that display white tigers have a long history of shading the truth about their mutants. The Cincinnati Zoo, an otherwise respectable institution, labels their white tigers as a “species at risk!” Nowhere on the zoo’s website or at its tiger enclosures does it point out that this species at risk is in fact an ecologically useless hybrid of Bengal and Siberian strains, inbred at the zoo’s own facility for big money. The Cincinnati Zoo repeatedly bred closely related animals over the past few decades to produce more of the white tigers, which they sold for around $60,000 each. White tigers are white because they have two copies of an extremely rare recessive gene found in Bengal tigers (the gene has never been seen among pure Siberians or other subspecies). A very few white tigers were seen in the wild in the early 20th century. On the face of it, being a white object in the Bengal tigers’ tropical habitat of India and Southeast Asia can’t be good for a predator that needs to be camouflaged. Other, more subtle problems that go along with the white coat would also prevent white tigers from ever becoming established as a wild population. The mutation (which is not albinism—white tigers can still produce melanin) also causes serious defects. White tigers in captivity tend to have problems with the way that their brains control their eyes and process visual stimulation. The animals are often cross-eyed in one or both eyes, bump into objects, and have trouble understanding spatial relationships when they are young. Animals with defects like these couldn’t survive for long in the wild, even though they have long lives in captivity. Other disorders, such as kidney problems, club feet, and shortened tendons, come from the severe inbreeding required to keep this recessive gene around. Not all of the cubs produced in white tiger breeding schemes are white. Inbred, hybridized tiger cubs with an assortment of health problems aren’t good for much of anything except roadside attractions. Some are kept in hopes that they carry a copy of the white tiger gene that could be expressed in offspring. Carole Baskin, director of Big Cat Rescue, has taken in some breeding-project duds, including a cross-eyed white tiger born without an upper lip. Every white tiger in a zoo is occupying an enclosure and a budget for food and veterinary care that could be used as part of a legitimate breeding program to protect the genetic diversity of endangered subspecies of tigers. There are fewer than 700 Sumatran tigers left on the planet, in captivity or in the wild. The Siberian tiger numbers no more than 1,000, at best. The survival of both subspecies is in jeopardy due to both habitat loss and a looming genetic bottleneck. We could safeguard the genetic diversity of both types of tigers with the cooperation of zoos and perhaps maintain them in captivity until the political issues that threaten their habitat can be alleviated. Some zoos, such as the National Zoo in Washington, D.C., and the Minnesota Zoo, do this now as part of a broad species-protection plan. But every zoo that devotes an enclosure to white tigers under the cover of a lie about conservation represents one more place where a legitimately endangered tiger could be kept. In 2011, the Association of Zoos and Aquariums banned member zoos from breeding white tigers, lions, and cheetahs (PDF). This ban should prevent top-tier zoos from continuing to breed white tigers, and the Cincinnati Zoo has recently stopped selling white tigers. But it doesn’t prevent member zoos from continuing to display the animals. And as long as there is demand, those top-tier zoos may still obtain white tigers from other sources. Meanwhile, the white-washing of white tigers by major institutions helps maintain not only ticket revenue from a misled public but also misguided support for the rescue of a nonexistent endangered species. A white tiger that has already been born does not have a vote in the matter and cannot apologize for existing. Humanity has a collective responsibility to care for the two-headed calves and white tigers that we create for our own entertainment, but do we really need to be creating more of the genetic disasters that pull resources away from truly endangered species? There is no good reason to breed another white tiger. We can choose to keep every remaining white tiger in comfortable isolation. Tigers are solitary in the wild (unlike lions, which are social animals that normally live in prides). They do not need the company of other tigers in order to lead happy lives either in the wild or in captivity. We can choose a future in which white tigers disappear into memory and hopefully one in which truly endangered subspecies of tigers maintain enough genetic diversity to be successfully reintroduced into a wild that can sustain them.